A New And Greater Tokyo is the Canadian debut by Man Of The Year, a Brit Rock combo leading the post-new wave charge out of Portland, Oregon. Loud and ringing guitars are at the forefront of elaborate melodic pop orchestrations not unlike perhaps Franz Ferdinand on downers with Brian Wilson arranging. The basic raw power of no nonsense guitar hooks is genetically ingrained in all Portland and Seattle bands since the days of The Kingsmen and The Sonics, and Man of The Year temper that power with an intelligent pop sheen all their own. This is the band's second album, and leader/guitarist Tod Morrisey's attention to lyrical detail transcends the staleness of commercial rock and forgettable pop clichés, resulting in an even more sophisticated sound than their critically acclaimed previous effort, The Future Is Not Now (2000). Since 1998, Man of the Year have been touring up and down the west coast. By 2000, they hooked up with producer Tony Lash (Dandy Warhols, Tahiti 80) and cut their first album, released on Loveless Records. The album gained national recognition rising to the top of the College Music Journal (CMJ) charts for 13 weeks peaking at number 5. Man of the Year's unique style and rock-pop sensibility has been noticed by more than just their fans and radio. Their songs have appeared on network television shows, including Buffy the Vampire Slayer (UPN), Miracles (ABC), Roswell (WB), and Tru Calling (FOX), as well as in numerous indie films. The band was also asked to appear in person on Buffy the Vampire Slayer to perform for the Halloween Episode in 2001 and was more recently added as a track on the Virgin Records UK Release of Radio Sunnydale: The Buffy the Vampire Slayer Soundtrack. 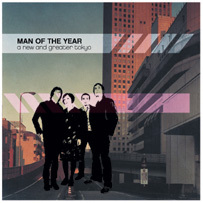 With strong songwriting, lush harmonies and the warm production of Tony Lash (Dandy Warhols, Tahiti 80) and Jeff Saltzman (Stephen Malkmus, Sunset Valley), A New and Greater Tokyo is the noteworthy next step in the musical evolution that is Man of the Year. The band is: Tod Morrisey, Guitars, Vocals; Kelly Simmons, Bass, Organ, Vocals; Brenna Sheridan, Keyboards, Guitars; and Paul Noel, Drums. "Man of the Year's stunning, shimmering brand of Brit-meets-new-wave-power-pop is a jaw-dropper."